The Days of Johann, an agility dog! : We're going on another adventure! We're going on another adventure! I am so excited, I'm doing my 'Sheltie' spin!!! Mum told me that we're going on another adventure, yep that's right! We've been living in a cabin in the Mountains of Tennessee for about a year now, and realized that we got our first 'Adventure Experiment' pretty right the first time, but that there are a few things we needed to fix; like being closer to a place to train for agility, closer to where we can purchase more organic foods for me, Mum, Gracie, Wolfie and Wiggy, and a few more little items. So over the past few months Mum has been talking with lots of folks in lots of areas around where we live, because we like the climate here; not too hot, not too cold, some snow, and lots of hiking ops. And she found a great new place for us to enjoy for a while. 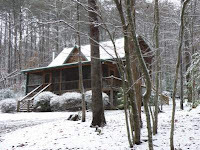 We're moving to a cool cabin in the Mountains of Northeast Georgia next week. It's about two hours from where we are living now, closer to agility training and trials in the Atlanta area, and lots and lots of hiking ops for us. Here's a cool photo of our new cabin taken when they got a little snow up there not too long ago. We heard that this past Winter they got over 33 inches of snow up there on the Mountain, but like here it warmed up after several days and was gone. Just our kind of snow, that's fur sure. We'll have a little more space in the cabin, a little more convenience, and a nice little front 'yard' that Mum's already lining up for help in building our temporary fence the week we get there. The kitties will have more places to look outside and enjoy nature from the lower windows and hide from me and Gracie :), 'cause we will have an upstairs now too. We are so excited, we can't wait to get there! Remember, we've got a big surprise coming to you on the blog this coming Friday, so be sure and check back, K? Here's a hint; it's something we've done before, and lots of folks really enjoyed it. It's something free and something that could really help you get to know your Mum (or pup :) even better! Stay tuned!!!! It will be so awesome moving to that pretty cabin in GA and being closer to agility stuff and Atlanta! Can't wait to see more photos once y'all get there! that cabin looks so cozy and inviting. I bet with the leaves open on the trees it will be so lush and cool....I have a "thing" about cabins and I would love to see the inside of this!